Rank: #4 out of 158. REQUIRES COMCAST XFINITY INTERNET SERVICE. Approved by and for use with Comcast Xfinity and Xfinity X1. ELIMINATE CABLE MODEM RENTAL FEES UP TO $156 PER YEAR. THIS PRODUCT WORKS ONLY WITH COMCAST XFINITY. Motorola MT7711 is a very popular and one of the most expensive options. It's in the top 3 bestselling modems and has dozens of popular alternatives in the same price range, such as Arris SURFboard SB8200 or Zoom 5341J . 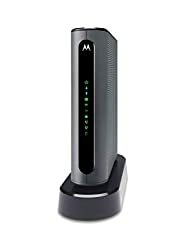 Motorola MT7711 is $95 more expensive than an average modem ($94.99).